“What Makes a ‘Safe’ Currency? A nation’s currency is issued by its central bank and a central bank is structured like any other bank– it has assets and liabilities. On the asset side of the balance sheet are things like government bonds and gold….Its liabilities include the nation’s money supply, technically known as central bank ‘notes’. Look at those US dollars, Canadian dollars, British pounds, etc. in your wallet. You’ll see they’re actually ‘notes’ issued by the central bank, i.e. liabilities. 1. A Central Bank’s capital ratio: Just like any other bank, healthy central banks hold portfolios of high quality assets and those assets should exceed liabilities by a substantial margin. This is known as a bank’s capital ratio, and it represents a bank’s margin of safety in the event of a crisis. Consequently, ‘safe’ currencies are issued by well-capitalized central banks with a high capital ratio. 2. A government’s balance sheet: It’s also critical to check the government’s balance sheet [because] central banks that get in trouble will require a government (i.e. taxpayer) bailout and heavily indebted governments won’t have the ability to do this. [The two points above] automatically eliminate the U.S. dollar because the Federal Reserve’s capital ratio is a laughable 1.53% and, since the U.S. government’s debt is nearly $17 trillion, there’s no chance Uncle Sam can bail out the Fed. This reasoning also eliminates the British pound, euro, and yen. Even the Canadian dollar is not in good shape given the country’s debt level and the razor-thin capital (0.53%) at the Bank of Canada. Singapore is an interesting case. In its just-published annual report, the Monetary Authority of Singapore announced that it lost $8 billion last year trying to keep its currency depressed against the US dollar. This is astounding… and suggests more than anything that this absurd dollar-centric fiat system is on the way out. Singapore’s central bank balance sheet is still in much better condition than the West with a 7.2% capital ratio and the government there has zero net debt, so the Singapore dollar is far safer than the dollar or euro. Looking at the numbers, the answer is simple. It’s the Norwegian krone. Norway’s central bank, which issues the krone, has among the highest capital ratios of any central bank in the world at 23.3%. The Norwegian government has zero net debt, i.e. its total financial assets far exceed debt. The krone is not pegged to any other currency, so it can’t be dragged down with a sinking ship. The Great Quickening has commenced in an alarming fashion. In just the last 3 weeks, 10 significant events have taken place suggesting that 2015 will go down in history as extremely messy, extremely chaotic, and extremely important in the demise of the U.S. dollar. This article identifies each of the 10 events and their enormous implications and fallout. This article suggests that the Australian and Canadian dollars, and the British pound Sterling, can expect to decline significantly relative to the U.S. dollar in the months ahead and gold to decline even further relative to industrial commodity prices. Here’s why. It’s common for the world’s most powerful country to issue a currency that becomes adopted around the world as the standard for international trade but whenever that country reaches a point of epic, terminal decline, and especially when it rapidly debases its currency, the rest of the world seeks an alternative. This article outlines the history of the rise & fall of “world” currencies over the centuries and then comments on what the future likely holds for today’s “world” currency – the U.S. dollar. The U.S. Dollar’s status as a reserve currency seems to be a perennial concern for many people these days. I think this concern is often dramatically overstated. Here’s why. options and opinions of each vary hood before you buy one. Spreading ones holding by investing in foreign currencies/stock, even in modest amounts makes great sense in these troubled times and for those that do so according to all applicable tax codes, should something happen in one country, at least part of their totally wealth should not only survive but possible do much better in the other countries! For example, if the US$ took a dive, then all the currencies that are linked to the US$ would do the same, but all those currencies that are not linked to the US$ (like Norway’s krone) would probably not only trade upward but could very well leap upwards as investors globally seek to re-position themselves in financially safer currencies. And where is the Chinese currency in all of this or does the author consider it insignificant and unworthy of mention? To be stable, money should represent a store of value- i.e., it should represent labor. 95% of the US money supply is not even printed, it exists only on a computer screen. There is no intrinsic value. 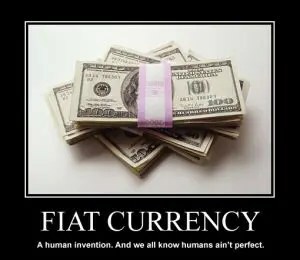 In any failing system, people naturally gravitate to the superior medium of exchange, whether it be some other fiat currency (which is doubtful), precious metals, or tally sticks. It also has to be desired in trade- an allure the “ol’ greenback ” is quickly losing. Any financial crash survival plan should include a variety of easily portable, divisible and valuable supplies on hand- seeds, cigarettes, toilet paper (invaluable) and so on. Labor is a store of value, yes, but so are food, housing and guns. Mainly guns, I’m afraid – meaning, protection from those who would steal your stores of value. Hired guns. Actually, hired guns are what work now to protect our individual stores of value. We call them “police”, but really they are an armed gang in the pay of rich men. When any currency in the world loses its cachet, the dispossessed will find another. Did I say guns? I meant bullets. Someone with a gun and bullets will get however much toilet paper he wants, believe me. I read you loud and clear, it is far better to read about social unrest in a distant land than to live through it first hand. One has only to read historical accounts of those the left Europe prior to WWI and/or WWII to see that they fared much better than the millions that decided to remain in place and ended up dying! Another criteria that I believe is important when considering yet another country to invest in and or acquire a cabin lot in is has that country been overtaken by one of its large neighboring countries in the past. Annexing Norway would be a prize for Russia should global boundaries get redrawn after a international fiscal crisis, which is why many look to Switzerland as a safe haven! If one is caught in the midst of a financial turmoil then it will get ugly quickly; far better to dedicate oneself to planning farther ahead and seek to be somewhere else long before things turn ugly. Legally owning a bit of foreign land, having an additional legal passport and/or other investments “overseas” may provide you a method to relocate that all those without them will not have, if things start to get ugly where one lives now. Being Prepared does not mean standing near the front of the line, waiting to buy what is remaining at your local market; in my mind it means reading about that situation from far, far away. Good to know! By sheer good fortune, my son and his two daughters live in Norway. Being a semi-retired hippy [see link below], he doesn’t take full advantage of what Norway has to offer in the way of financial stability, but he does have a permanent residence there – a cabin built in the middle of a forest. And, my wife and I are hoping to buy the quarter-acre next door for our own cabin. It’s a pretty relaxed life in Norway. The Scandinavians in general are famous for having found the perfect work-life balance. I’m not sure it’s better than the Caribbean balance, where he was brought up and where his mother and I still live. But we are happy to invest some of our modest savings in Norway, and it’s good to read good things about the place and its currency. I image that ever more people will start to acquire a small “cabin” sized holding in one or more countries like Norway, because they will offer a safe haven should times get tougher in the USA as many expect them to do! Salute to your son and his daughters who are now well positioned to welcome you to all Norway has to offer!